This entry was posted in New and Noteworthy Blog on February 12, 2019 by Lauren Pearson. 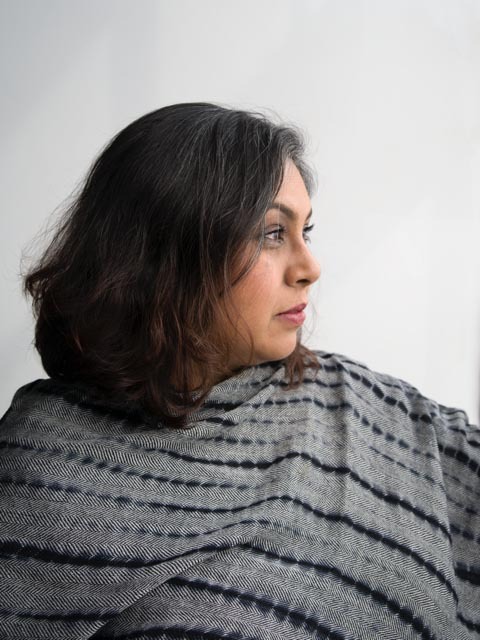 After completing her masters and Ph.D in art history at New York University Aruna D’Souza began what would become an acclaimed career as a writer. In conversation with Allan deSouza the two talked about Aruna’s thoughts on art historical practice and where it has led her as a writer. “I didn’t want to write in footnotes” D’Souza said, “I wanted my intuitions to coalesce into thinking”. D’Souza spoke of feeling confined by art historical practice, and frustrated when she was unable follow her own trajectory of thinking using art history’s typical methodology. D’Souza is interested in tracing large scale colonial atrocities, such as slavery, to smaller ontological patterns in daily life. She left academia after feeling frustrated by its tendency to confine her work, and began a blog in which wrote about post-colonial experience, trauma, and food. Explaining another aspect of her refusal of traditional art historical methodology, D’Souza commented, “I didn’t want the mantle of ‘critic’ because I didn’t want the mantle of judgement”. She attempts to explore a reparative mode of writing, one that appeals to underrepresented communities of color as opposed to a more dominant white public. D’Souza insisted that her writing was not art history, explaining that her work doesn’t add to a debate about aesthetics; it is about revealing the harmful practices of institutions. The quintessential art institution is of course the museum, but museums are in a business of protecting whiteness, D’Souza explained. They have set up mechanisms for the community to talk, but haven’t invested in any mechanisms for the museum itself to listen. In this way, history will continue to repeat itself because it continues to be designed by those who have access to it, which, for the most part, are white people. The museum often poses as a neutral space, but they are really some of the most ideological institutions that exist. They want to be a platform for debate, but in fact, they are one of the debaters. D’Souza also highlighted social media’s archival capabilities, capabilities that resist the hegemonic influences of traditional art institutions. As opposed to museums, the archive social media creates is one of public dialogue. In this way, D’souza explains, social media avoids marking certain topics, works, or artifacts as more important than others as opposed to the institutionalization of specific cultural narratives through museum display. D’Souza’s most recent book Whitewalling: Art, Race, & Protest in 3 Acts, is what D’Souza explained as a “journalistic” account of the methods of exclusion and appropriation often employed by museums as early as 1969 and as late as 2017. Despite its focus on the politics and history of art, D’Souza made clear that the book refuses typical art historical practice and is taken up with revealing the harmful consequences of institutional ideology and action.